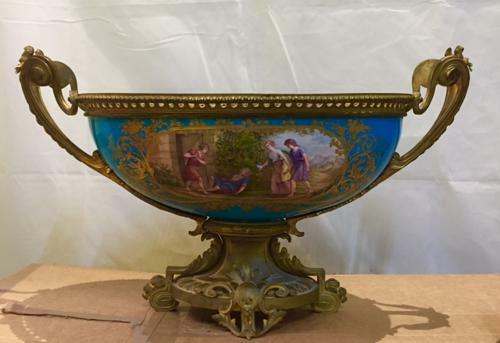 Large Antique Sevres Porcelain Jardiniere with Handpainted 'Fragonard' Large Central Panel Framed in Gold on a Turquoise Background. The Reverse is Decorated with Handpainted Flowers also Surounded by Gold Flowers on a Turquoise Background. The Inside Decorated with Turquoise and Gold Ribbons and Central Floral Panel. Fine Dore Bronze Mounts, High Handles and Dore Bronze Foot.